Oil Prices Edge Upward After U.S. Imposes Sanctions On Venezuela The sanctions are meant to put pressure on Venezuelan President Nicolás Maduro, who allegedly diverts billions in oil profits to pay off military officers and help prop up his government. 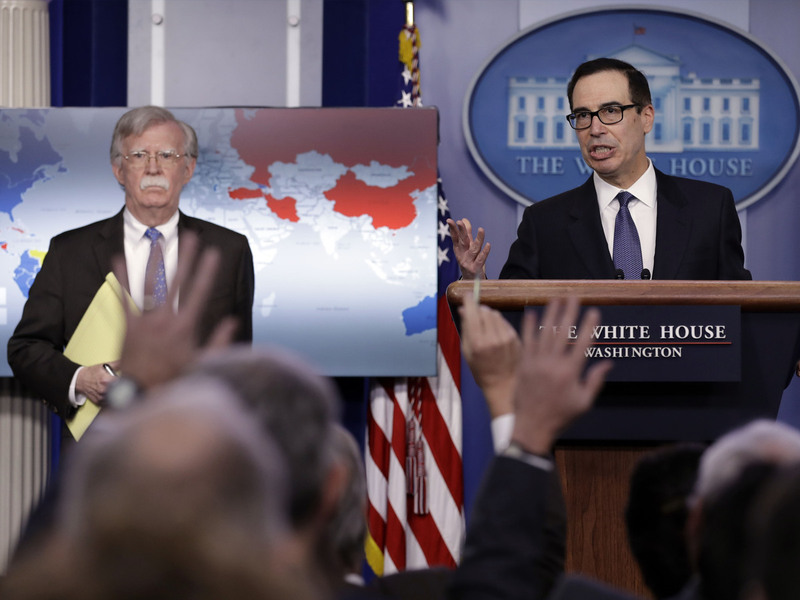 Treasury Secretary Steven Mnuchin (right) and National Security Adviser John Bolton announce sanctions against Venezuela, which are meant to put pressure on Venezuelan President Nicolás Maduro. Oil prices are up more than 2 percent after the U.S. imposed sanctions on Venezuela's state-run oil company known as PDVSA. As of Tuesday night, International Brent crude oil futures had risen 2.32 percent to $61.32 a barrel, and U.S. West Texas Intermediate crude futures went up 2.54 percent to $53.31 a barrel, Reuters reported. Prices continued their upswing early Wednesday. The U.S. Treasury Department announced sanctions Monday that effectively halt U.S. purchases of oil from Venezuela, NPR reported. It's part of an effort to push out the country's president, Nicolás Maduro, in favor of his rival, Juan Guaidó. About 40 percent of Venezuela's oil is sold to the United States. "The U.S. claims that Maduro and his inner circle divert billions in PDVSA profits to their personal accounts and to pay off military officers said to be propping up Maduro's government," reported NPR's John Otis. Venezuelan economist Francisco Rodriguez told NPR that if Maduro remains in power, we can expect to see a 40 percent drop in Venezuelan oil production within the next few months. The U.S. is Venezuela's top customer of oil, CNN reported. Under the restrictions imposed by the administration, U.S. companies can still buy oil from the Latin American country, but all proceeds would go into a "blocked" account and be inaccessible to Maduro, Reuters reported. Otis explains that "under the sanctions, any further U.S. payments would go not to Maduro but into bank accounts that could be used by Juan Guaidó, Venezuela's self-proclaimed interim president." Maduro on Wednesday called the U.S. sanctions illegal, as reported by the Russian RIA news agency in Reuters. American refineries could lose money now that they can't get their crude from Venezuela, Rystad Energy analyst Paola Rodriguez-Masiu said in a statement. Many American refineries in the Gulf Coast import heavy crude to mix with lighter oil coming out of shale basins in the U.S., Rodriguez-Masiu said. "With sanctions in place, those refineries will have to turn to other sources" — likely from the Middle East, and at a premium, she said. "U.S. refiners will be amongst the biggest losers." Meanwhile, she said, countries such as China and India now can pick up the unsold Venezuelan oil at a discount. For them, news of the sanctions "was akin to Black Monday." In the absence of Venezuelan oil, the Trump administration is now considering tapping into the country's emergency reserve of crude, Reuters reported, citing a government source. The Strategic Petroleum Reserve is held in underground caverns in Louisiana and Texas, and holds about 649 million barrels of crude.